Designed with a partial, finished walkout basement, this hillside home boasts a number of custom details inside and out. A cathedral ceiling spans the foyer and great room, where built-in shelves flank the fireplace and French doors access the back porch. Tray ceilings enhance the dining room and master bedroom, while box bay windows with built-in window seats brighten the breakfast area and first floor secondary bedroom. Secluded for privacy, the master suite features his and her walk-in closets, a linen closet, and luxurious bath. 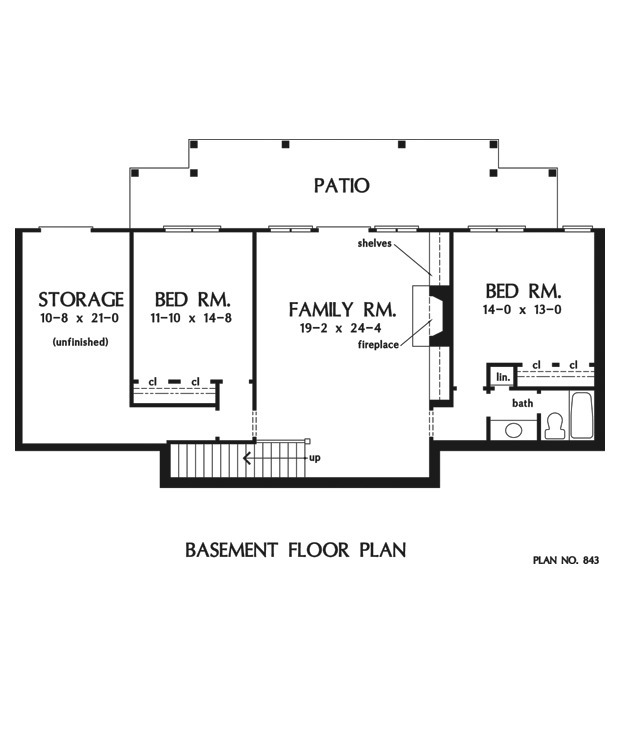 Two more bedrooms, a large family room, and an unfinished storage room occupy the basement floor. Other Storage: 281 Sq. Ft.
House Dimensions: 59' 4" x 73' 2"
Foyer (Cathedral): 12' 0" x 7' 8" x 20' 0"
Dining Room (Tray): 11' 8" x 12' 8" x 10' 6"
Great Room (Cathedral): 19' 0" x 18' 10" x 20' 0"
Utility Room : 12' 0" x 7' 8" x 9' 0"
Master Bedroom (Tray): 14' 8" x 17' 0" x 11' 6"
Bedroom #3 : 11' 10" x 14' 8" x 9' 5"
Bedroom #4 : 14' 0" x 13' 0" x 9' 5"
Porch - Front : 17' 10" x 6' 0" x 0' 0"
Porch - Rear : 42' 4" x 6' 0" x 0' 0"
Deck / Patio : 42' 4" x 6' 0" x 0' 0"
Storage (Other) : 10' 4" x 20' 8" x 0' 0"
Other : 19' 2" x 24' 4" x 9' 5"